So in addition to a brand new blog design, this week holds some other big news about an exciting new project I am involved in. Today is launch day for Great.ly, a brand new e-commerce site designed to put tastemakers together with makers and create a platform for them to market and sell work. 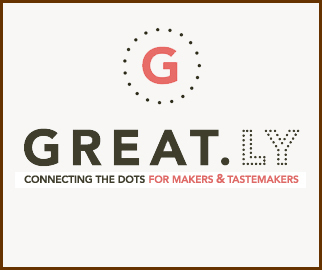 As my long time readers know, one of my missions has always been to showcase and support artists and artisans and their creations so I am so excited to be one of the initial 50 tastemakers on the new Great.ly site. I have been busy curating my online boutiques which you can get to by clicking this link or using the Great.ly button on the side bar. You’ll find work from familiar faces as well as new ones. …to ume (plum blossom) and ichimatsu (checks) in bright new colors on Tsukiji market shopping baskets, her unique line of homewares and carryalls is spectacular. To read more about her modern take on this ancient craft, take a look here and here. Remember, every piece is one of a kind, so shop the boutique here early! 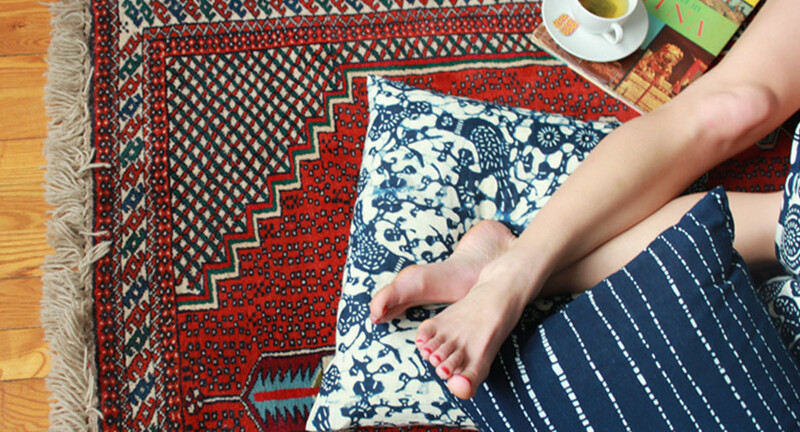 Another long time Tokyo Jinja favorite is the gorgeous handmade textiles of LuRu Home based out of Shanghai, China. 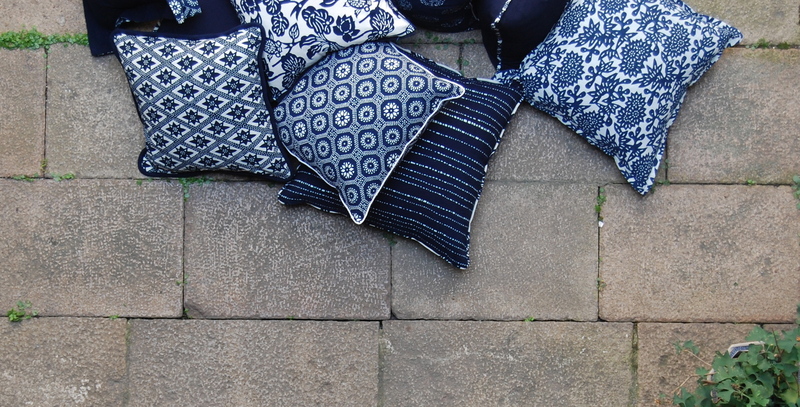 Liza and Claire are working with modern versions of nankeen, a dense hand-woven cotton fabric which has been stencilled and dyed in an indigo bath. With their beautiful products, all made from the custom hand dyed fabric in updated versions of traditional Chinese patterns, they are taking up the banner of preservation of this ancient form of craft, while innovating at the same time. 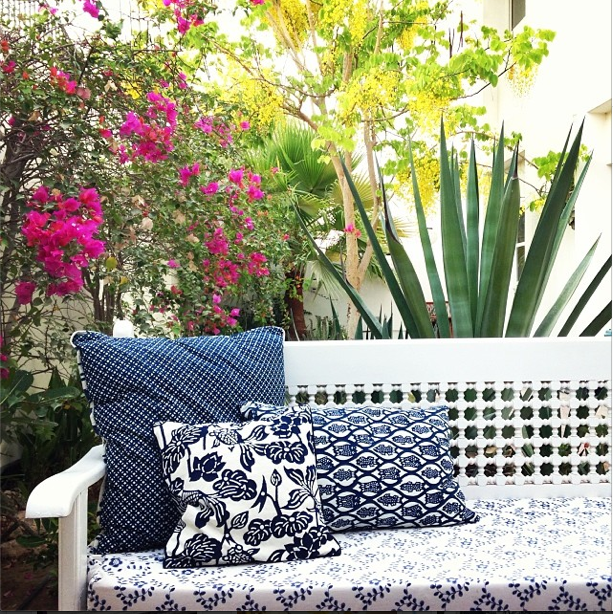 Their blue and white textiles bring a sense of cool to my very hot – both literally and colorfully – backyard here in Doha. They also play very well with pillows in other colors and textures. Be sure to click here to read their full story and see the pillows in action and here to shop the boutique. …or be converted to a cross body bag with their ingenious strap. Seems like a ‘must have’ item for a good textile junkie, creating the possibility of a purse from any piece of cloth. 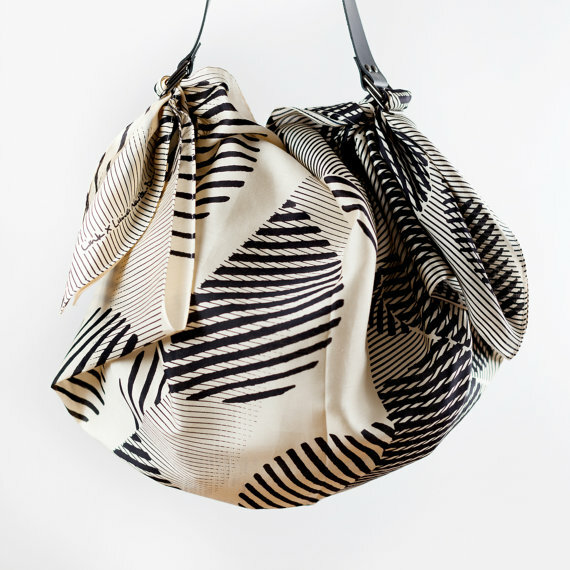 Their furoshiki are all made in Fujisawa, Japan, hand-printed and sewn by a family owned business with over 50 years experience in furoshiki production. 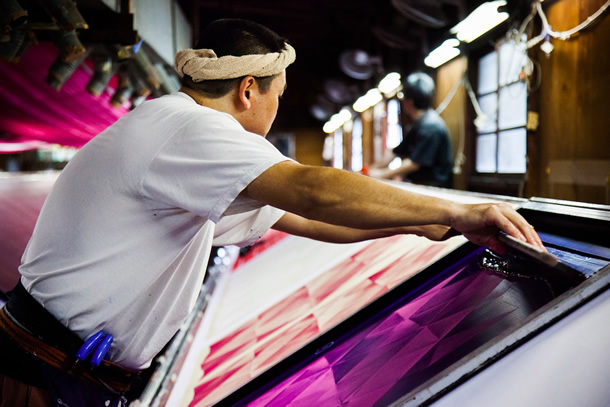 Although Japan’s craftsmen often spend a lifetime perfecting their artistry, much of that skill and knowledge is being lost as today’s mass production, cost cutting and on-demand culture drives ever more business decisions. Invaluable knowhow is disappearing as tools are put down, and the last small factories and workshops die out. 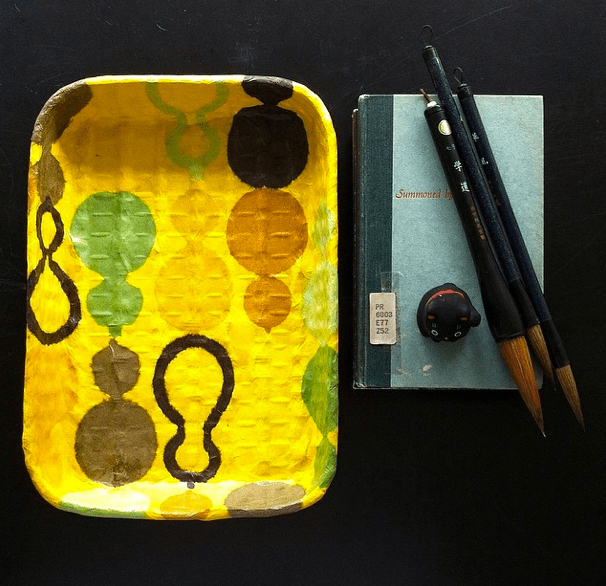 Like LuRu Home in China, they are playing a part in keeping these crafts alive by showing what can be achieved when creativity and craftsmanship come together. For toting your heavier items, I am loving the work of the Tacoma, Washington-based duo Jacqui and Scott of Year Round Co. They hand make every bag themselves, from cutting each piece of fabric, to designing and screen printing it, then sewing and applying all the leather and hardware in their home studio. For a glimpse into their workshop this great video really demonstrates the artisanal quality of their products. Their collection is inspired by stormy seas, mossy rocks, and earthy travels. And as you all know from my past ten years of deep involvement with hanga, modern Japanese prints, I have long been a champion of works on paper. 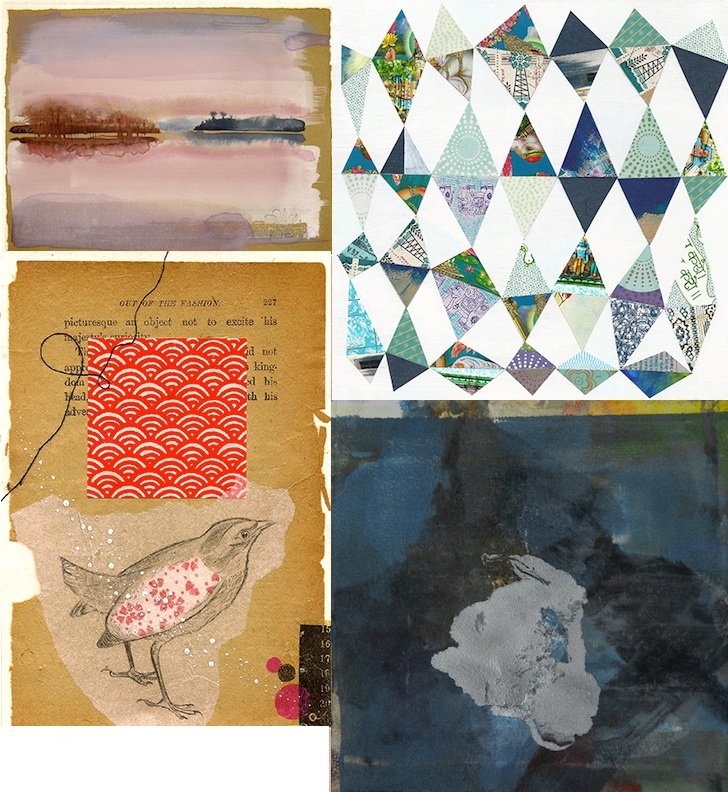 Works on paper, about paper, using paper, are some of the most affordable and charming artwork to be had. I am just beginning to explore some of the talent on Great.ly, so be sure to keep watch on this boutique as I add items in the coming weeks. To quote one of the new artists I am just getting to know, Shelley Kommers, “I am always on the lookout for beauty, and I find it everywhere: in the decayed, the imperfect, and the ironic; in the small, tucked away places no one else looks.” I’d like to adopt that as my personal mantra. So come on over and check it out. Just click here and start exploring. There are many other makers and categories I don’t have room to mention here. I think you’ll like what you find. To be honest, there are still quite a few kinks to work out, so please be patient and let me know if you are having any trouble making a purchase. Be sure to keep coming back as I will be adding to my boutiques regularly. And if you are a maker or know someone else who is, looking for an outlet to sell and show your work, please contact me, either by leaving a comment on the post or via email at jacquelinewein[at]yahoo.com. Maybe Great.ly and I are just what you are looking for! So, if a picture paints a thousand words, what does this one paint for you? Do you see antique blue and white porcelain umbrella stands and plant holders? Or do you see three squatty potties and two urinals? If you chose the latter, then you have chosen correctly. 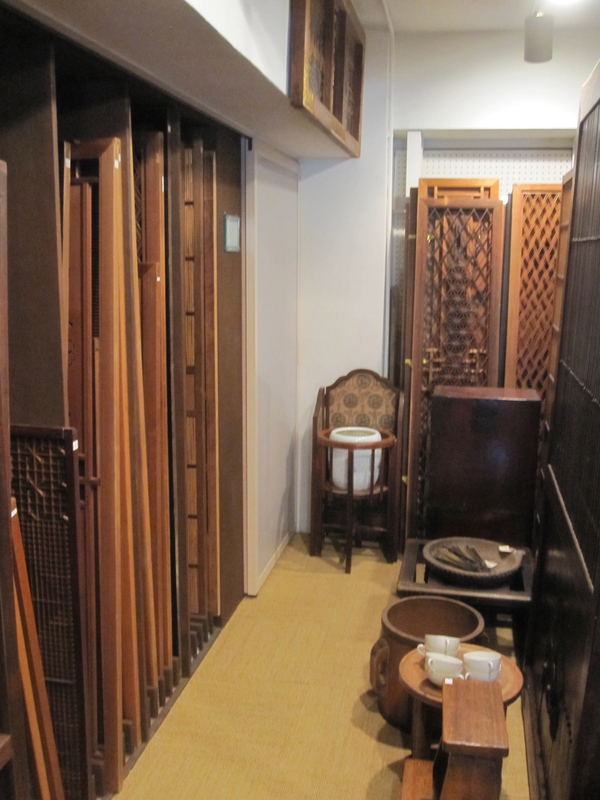 Antique blue and white toilets called benki were popular in the late Meiji and Showa periods, often installed in fine ryokan (inns) or wealthier people’s homes. Fairly rare as singletons, to see an entire collection of five all together is almost unheard of, but this dealer at Kawagoe shrine sale last month bucked the odds. I assume he salvaged them all at one place, perhaps as an old building was being torn down. Most of these painted pieces are in the Seto style, my favorite, although some seem to be Imari as well. And they were definitely produced on some kind of large organized scale as I have noticed there are only a few basic shapes and patterns that are repeated in all the ones I have seen. 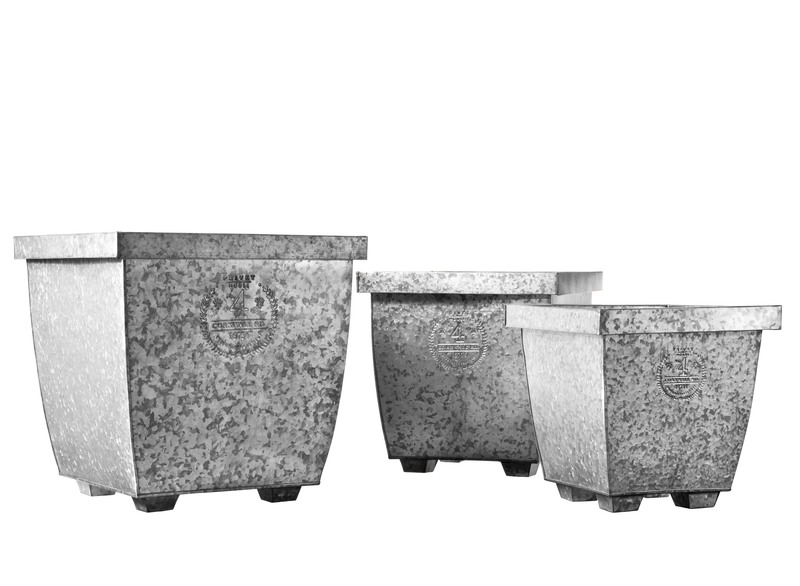 The toilets tend to be rectangular, with a squared off front or oval, with a rounded front. The rims always have a tiny detailed painted pattern, quite often traditional karakusa (scrolling arabesque), while the under hood area has a large bunch of flowers. The urinals fall into one of two categories, either the more tubular umbrella stand shape on the right or the more cornucopia shaped one laying on the ground on the left. Older examples, both of the toilet and the urinals, like the one I saw before here, are hand painted, while the later versions are often more heavily transfer printed. Somushi Tea House in Kyoto looks as if it has been around for ever, but actually was renovated to look old. To give it that Meiji feel they installed vintage bathroom fixtures. If you were at all confused about how this functioned as a toilet, here’s your answer. And note how similar this one is to two of the toilets above. On the left is the urinal at Somushi which is more of a cornucopia shape and looks like an earlier hand painted Seto piece. The photo on the right is not as finely painted and looks to be Imari, but it is quite similar to the one laying on the left in the Kawagoe photo above. Umbrella stands seem to be the standard use du jour of retired urinals. The toilets make good planters and I have even seen one turned vertically and used as a garden fountain. Now for those of you who don’t know, there is complicated toilet etiquette in Japan. In addition to taking off your shoes upon entering any home and putting on slippers, there are special separate toilet slippers kept inside the bathroom. Normally these are ordinary slippers, but I have actually seen painted porcelain ones on a few occasions, out in the markets that is, not in someone’s home. Were these really worn? Or are they just ornamental? I’m not sure, but I didn’t buy this pair last May because their condition wasn’t great. I think they’d make a witty addition to a vignette. I have seen a few other pairs in my travels and they have always been similar to these, with that distinct feathery Seto style painting. Without any formal knowledge on the subject, my instincts tell me that the idea for the painted fixtures comes straight from the West. It was not unusual to have painted and transfer printed toilets in the 19th century, like these Victorian versions from Great Britain. There was a tremendous amount of cross-fertilization in the porcelain industry going on in the late 19th century, with ideas, motifs and techniques (such as transfer printing) winging their way back and forth. I think it has been more than a year ago at least that I promised to do a full shopping guide to the vintage and antique stores in the Meguro neighborhood of Tokyo. Commonly referred to as Interior-dori, it stretches along both sides of Meguro-dori (dori meaning street), south-west of the Meguro train station from just past Yamate-dori, all the way down to the central post office. After my last post mentioning the lack of furniture available here, I got a few kind complaints as to the truth of that statement and thought it time to fully investigate and report on this unusual cluster of stores. These adhere to that “car dealership synchronicity” adage I have talked about elsewhere (here and here, for example) and numerous people, mostly couples, were browsing on the public holiday earlier this week. With a complete lack of parking and the train station a bit of a walk, the density of shops is needed to bring the public. My tour starts at the intersection of Meguro-dori and Yamate-dori and heads along the south side of the street walking. I stop in at most of the shops on both sides, although there are a few I missed, so the list is not exhaustive. There are also stores tucked away in the back streets near by, such as the lovely Found, but those are not on this tour. Many of the merchants are listed on the MISC (Meguro Interior Shops Community) webpage and the shopping map to the area that can be picked up at participating stores. 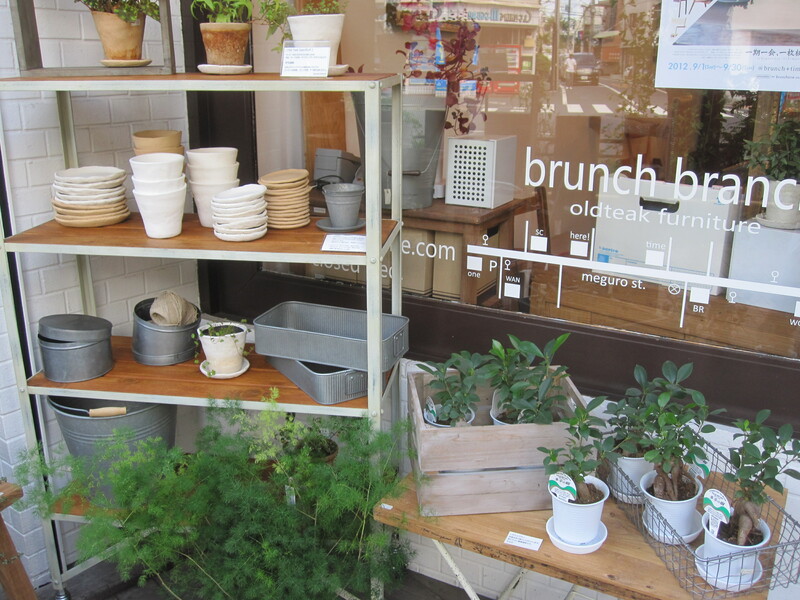 Both for those really looking to furnish a home to those just looking for small gifts and Japanese styling, it is a fun outing. While most of the stores are channeling that mid-century vibe or at the very least European shabby-chic, one of the first stores on the south side of the street is Chapter, featuring Japanese antiques. One of their specialties is repurposing, so antique ranma (transom panels) are turned into consoles, dining tables and wall dividers. There is quite a collection of them at the back of the shop. They have great vintage milk glass fixtures too. I thought this was ingenious – tucking a hard to use small tansu into a larger modern piece of furniture. Brunch + SC was one of the first of five or six different Brunch outlets (Brunch Branch, Brunch Works, Brunch Time, etc.) all selling their modern versions of furniture inspired by the mid-century. You can see on their logo map below that they stretch all along the street and line both sides. 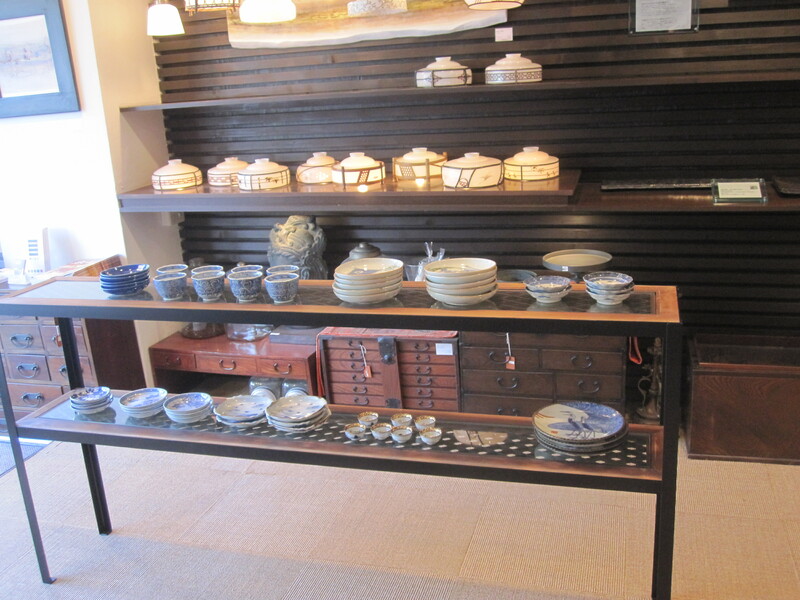 Each shop has their own particular pieces, but this photo gives a general sense of the style. There was a western couple shopping here and the sizes of the furniture seemed normal and comfortable. Much of it is teak and order made. 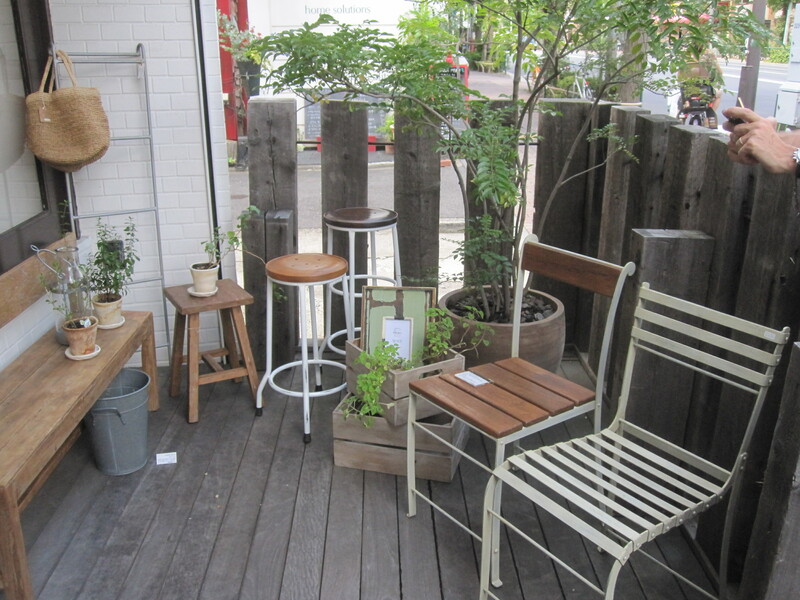 Really great chairs (think Wegner Wishbone) at these shops – and they are currently having a chair fest through September. Brunch Branch nearby had charming garden items. I had to go into chambre de nimes just based on that stacked luggage in the window. Everything inside the shop seemed to be imported from France and the place had a real les puces vibe. This was the first of many places that also stocked vintage church pew chairs with a pocket in the back for prayer books. They are super popular here in Japan and I’ve seen them often elsewhere, particularly at the Penny Wise. And the first, but not the last of the day, of the sewing machine base consoles. New Jersey to Japan – they are everywhere. The next shop AMS seemed to be different owners on different floors, but the ground floor was full of vintage chandeliers and country-style antiques, including windsor, ladder back and the ubiquitous church chairs. …a similar one was for sale on OKL for the same price on the very same day. And Becky at Buckets of Burlap just recently put her vintage zinc bottle dryer up for sale for $500. Gallery S featured a combination of vintage and new furniture, but seemed to specialize in hats. Yes, hats. Love the wooden and painted iron desk and chairs on the right out front. Tucked away upstairs across the small side street is Point No. 39 which looked promising just from the sign alone! And the word repair was quite intriguing as that is hard to find in Tokyo. It did not disappoint, being stuffed full of great lighting, furniture and decorative pieces. I loved the giant sunburst mirror. And by the way, it is also a bicycle store. Go figure! File Home and Interior was full of gorgeous housewares and also boasted one of the prettiest kitchens I have ever seen in Japan. Turns out there are a few more File shops across the street including one that actually designs and installs kitchens. After File, things petered out and before reaching the big Meguro post office I decided it was time to cross to the north side of the street. Anchoring the end on the other side of the street is the giant four floor Geographica. The second floor is home to a charming Italian restaurant Il Levante where I stopped for lunch. There are not many choices for food along the main drag, so I recommend it for a rest or meal. Geographica was stocked with English antiques – they even carry Sanderson’s line of William Morris Fabrics – and at times felt a bit like a gentlemen’s club. Lots of dark wood, bentwood chairs and framed engravings. One really useful thing they stocked was a full line of knobs and pulls and other hardware. And I love these brass train racks – how great would one of these be in a bathroom? They also have a Yokohama factory shop where they do their restorations. Pour Annick had more of the golden wood mid-century inspired furniture as well as some fun quirky items. What about one of these bright stools for the teen bedroom project I am working on? Since the previous shop that involved climbing stairs was such a success, I made sure to go up to Blackboard. I was rewarded with industrial chic and some real mid-century pieces. The curated display of found objects was inspiring too. I forgot to check if they are actually for sale. Blackboard also had some great English language design books. Roughly across the street from Junks on this side is their sister shop Moody’s full of more vintage furniture and lighting. Many of the pieces had big signs advertising their origins, whether it be Heywood-Wakefied or Eames. It felt like there might be a great find lurking in here. Meister is one of the leading stores on the street carrying modern versions of those same mid-century design icons, including Nakashima style wood slab tables. This Eames molded plastic rocker is available for order in a full range of colors and was about $650. A new Eames rocker in the US is $549 at Herman Miller or Design Within Reach. I didn’t go into Stanley, but just the idea that there might be somewhere to have custom upholstery, rehupolstery and slip covers made here in Tokyo was revolutionary. If anyone goes in to inquire about a project, I’d love to hear about it. The De Mode shop felt the most American of all the shops, channeling the rough luxe thing. 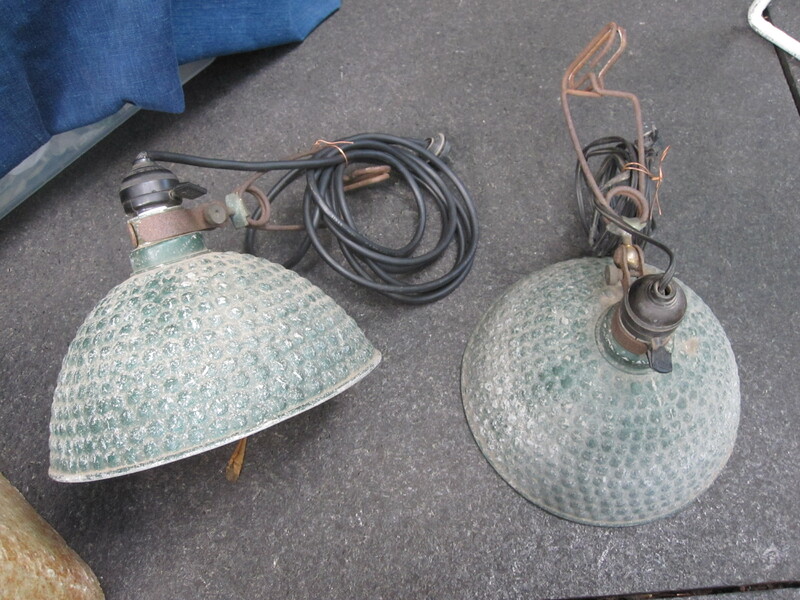 Check out those industrial light fixtures! They have Tolix style chair too. If you click into their website, they seem to have a number of other fabulous locations, including a warehouse. Definitely something to explore next! I found it oddly reassuring to see that I can buy glass Ball jars here although I forgot to check the prices. Lewis specializes in Danish modern. And at the very end of the tour, almost back to Yamate-dori are three outlets of a recycle shop called Sone Chika. Japanese recycle shops are akin to thrift stores in America and are hit and miss like you would expect. There are definitely finds to be made, although no luck for me that day. Most of the stores are open from 11am until about 8pm and Wednesday seems to be the closure day for the area. You might want to call ahead if you are interested in a particular spot. Be sure to click the Shop Talk tab in the category list on the right side of the blog for more store reviews and neighborhood strolls. OK, I actually wanted to call this post “I’m A Genius” but out of love my best friend wouldn’t let me. Do you know when you are so excited about the smallest accomplishment that you want to crow about it ridiculously? Home almost two weeks, I still feel sluggish and am beating myself up for not getting more done at the house. The truth is that the more you near completion, the harder it is to find and finish those details, as in, “will I ever have night tables in my bedroom?” because they need to be such a specific height and size and work with everything else in the room. So my moment of joy comes from a good idea mixed with some luck. I am slowly organizing and styling the Sonoma bookcase in the TV room that I wrote about previously here. One conundrum concerned the cable box, DVD player, modem and the millions, yes millions, of cords that connect them all (which are even worse than they look here). As you can see in the photo below, even stacked one on the other, the components look skimpy and the cords are an eyesore. I had thought of hiding the players in a basket, but the remotes don’t work. Yesterday I made the rounds at all my Point Pleasant antique shops and found this vintage delivery box, much like the one I featured here last year, but larger, at what I believe was the Summerhouse booth of Joanna Madden, who I wrote about here last summer. I forgot to take a photo of her display at Canvas House Antiques, but it was just what you might expect – peely paint furniture and glass bottles, lots of charm and patina. An idea of how to use the box was forming in my mind, but I wasn’t sure if it could be done. I stopped off at the local hardware store for some twist ties – no black, only green gardening ones which will have to do right now – and set to work. Voila! How fabulous is this? The box was just the right size to sit the cable box on top of the open side. This gives the electronic components enough vertical lift that they fill the shelf space nicely (and keeps the “Fancy Print Butter” label right side up). 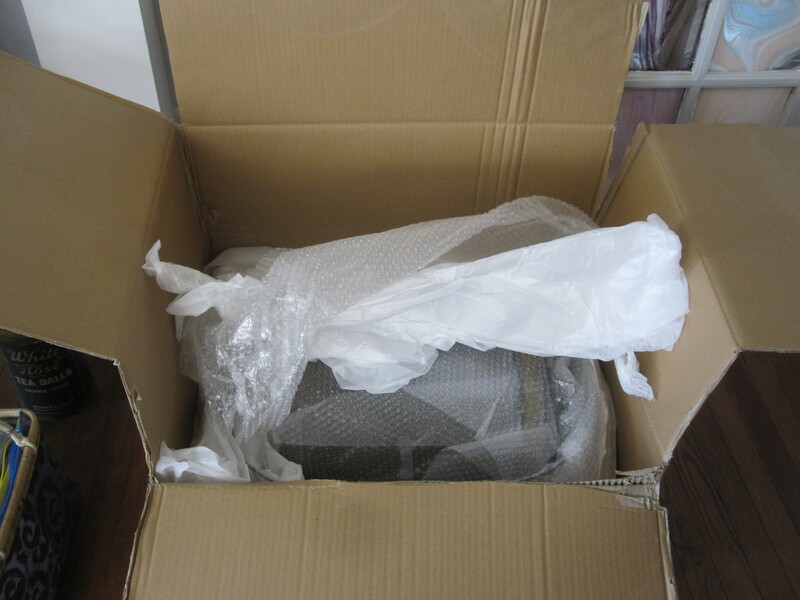 Better yet, all the power cords have been bundled inside the box at the back. The ones stretching down from the TV have been tied to the iron X bar that supports the shelves – I’ll need to improve on those but I was in a hurry. I plan on disguising the modem on the shelf below with a storage basket on one side and some large books on the other, or perhaps I will stumble across some other fun and funky object. I promise the whole bookcase soon. I just have to get to the Ladies Auxiliary Book Sale next week to beef up on my reading material! A pair of vintage fans. A lacquer wagashi (Japanese sweets) covered case, a vintage brass and porcelain iron (can you spot the kanji character?) and a favorite blue and purple transferware bowl forgotten and recently found. And the piece de resistance, a brass and tin-lined film reel canister, designed to protect old movie reels from fire and damp. It is from a theater in Ginza and seals tightly. I am not sure this photo does it justice, but I am sure you’ll be seeing more of it as I am thinking of using it for recycling in the kitchen. I also brought back this huge wire basket – no purpose in mind yet – but so lovely and sculptural. You can see another one in the background of the photo – I seem to be collecting them! I am getting the house in order and starting to make a list of everything that needs to be done, but finding the key pieces I still need to be elusive (remember, I have already done a pass through my favorite antique stores with no luck). I might need to travel further afield, and on that note, I am dying to visit Privet House in Connecticut. Billed as “an Emporium of Home Goods, Antiques and Curiosities” giving it a John Derian-esque air, I first heard about it through a post on the wonderful Good Bones Great Pieces blog written by Lauren and Suzanne McGrath, whose eponymous new book is also on my must read this summer. Privet House is the baby of Richard Lambertson and Suzanne Cassano, two well-known design industry professionals and neighbors who joined forces to open the shop. Everything in their photos looks interesting, but I am thinking I am so riveted by it because of the paint color – Benjamin Moore Sweet Innocence 2125-50 – so similar to my own beloved Benjamin Moore Pelican Gray 1612. Shopping there would almost be like trying everything out at home! Vintage leather suitcases – you all know where I stand on those! Funky swing arm lighting – you know where I stand on that too. And doesn’t the shade remind you of these from here? I have the feeling it all may be very pricey, so I might just have to content myself with some of these Turkish hammam towels. Dreamy colors, don’t you think? 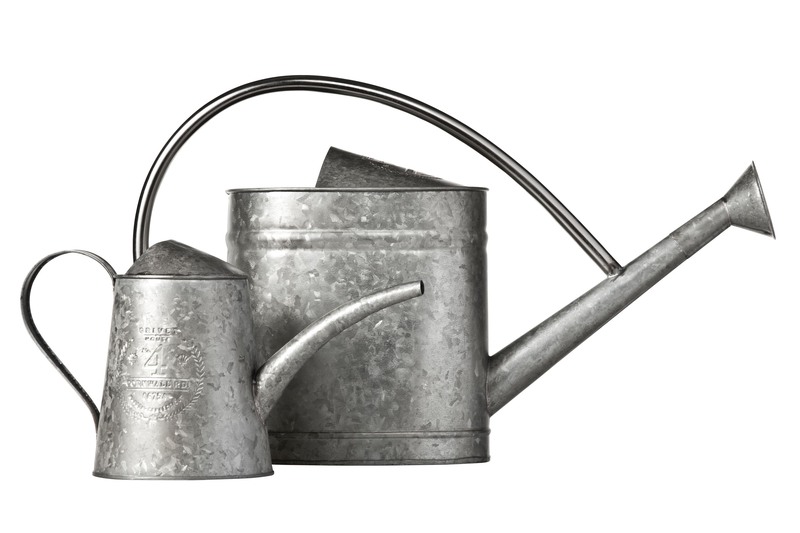 But the good news is that the Privet look is available to the masses at The Shops at Target – they have a branded line there right now full of lots of things I love including galvanized tin garden supplies. …and these embossed white china ones which may be my perfect summer home basics! So in addition to the antique shops, I have also managed to make it over to Target (but still not the supermarket) and loaded up on Privet House items – all on sale too! Jet lag fugue state closing in so it is time to go sit on the porch. 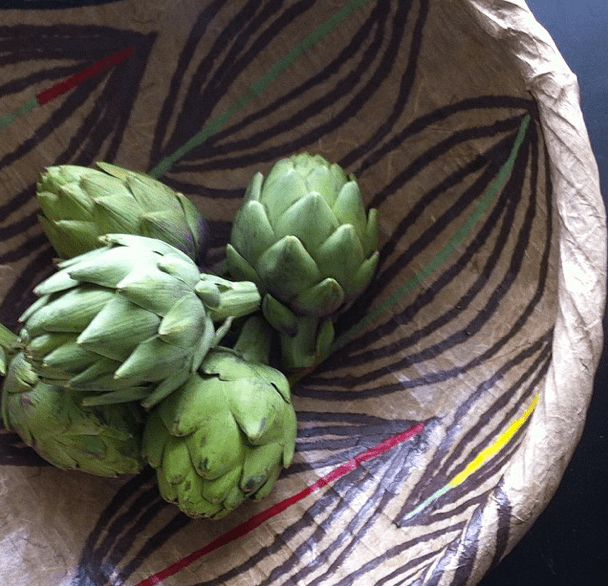 And my children want dinner – the nerve of them! Here’s one more image of wonderful things here at the house – my hydrangeas are gorgeous and look so pretty in the transferware bowl. And you can see how similar the wall paint color is too!